First, I’ll start with all of your questions. 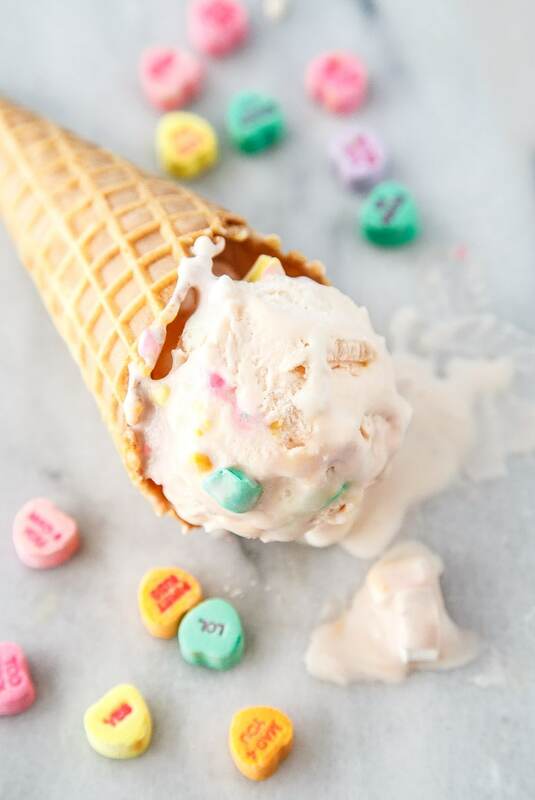 Q: Do the conversation hearts get soggy in the ice cream? Q: Are you for real with this? A: Yes yes, very much so. Valentine’s Day is the best time of year for candy! I never really get into Christmas candy much, because it’s usually very chocolate-centric. I’m a fruity candy person, all the way. And while conversation hearts are probably as far away from real fruit as you can get, I still love the orange and lime ones best. So, as soon as I see Conversation Hearts, I grab ’em. I also grab: sour cherry balls, cinnamon hearts, and festive Valentine’s M&Ms for making cookies and brownies. 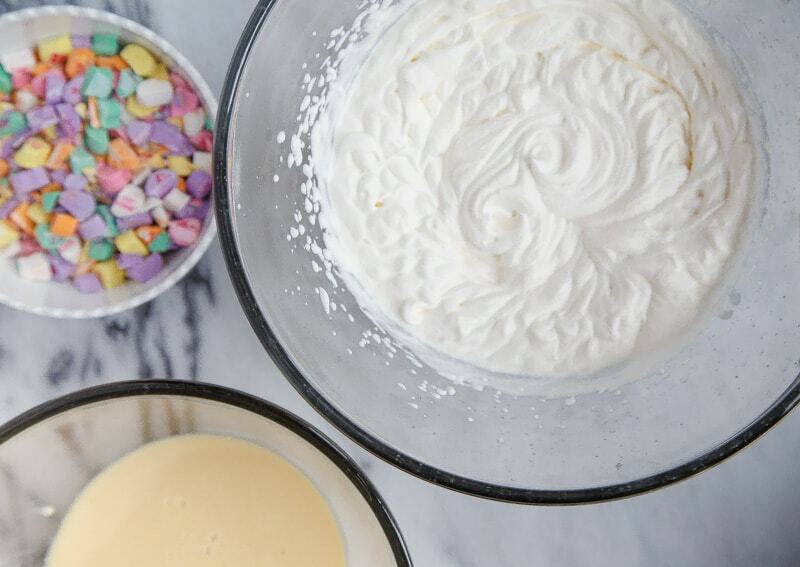 You only need 3 ingredients to make this ice cream. Well, 4 because I forgot to photograph the vanilla extract. Yes, yes–hell has frozen over. I finally succumbed to the no-churn ice cream method using sweetened condensed milk. I avoided it for a long time because sweetened condensed milk has such a strong flavor, but I finally found a brand that I like. It’s Trader Joe’s (of course). So, good people: this is a 7 ounce bag of tiny conversation hearts. Chop all of it up except for a few handfuls. Put the extras in the pocket of your favorite jacket. So, like 5 ounces or so? You can estimate. Just don’t add the entire bag, ok? Then, whip the cream until stiff peaks form. I used a hand mixer because 2 cups is a lot of cream to mix by hand. Stir the hearts into the condensed milk, along with a fat tablespoon of vanilla extract. Sorry I didn’t snap a photo of that. Then, gently fold in the cream. 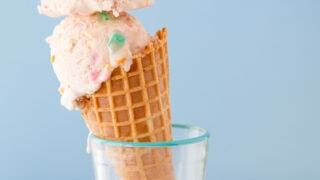 Some of the smaller pieces of hearts will dissolve and color the ice cream base a lovely shade of peach. Gently fold in the whipped cream using the proper folding technique: through the middle with the skinny part of the spatula, and then sweep the outside edges of the bowl. It takes a long time to fold properly, but if you stir it all together like a mad woman, it won’t be as fluffy. Trust. Scrape it into a bread loaf pan (this recipe makes just 1 pint of ice cream), press wax paper directly on the surface (a little tip I picked up from The Kitchn), and freeze for at least 8 hours. Serve it with more conversation hearts because enough is never enough! 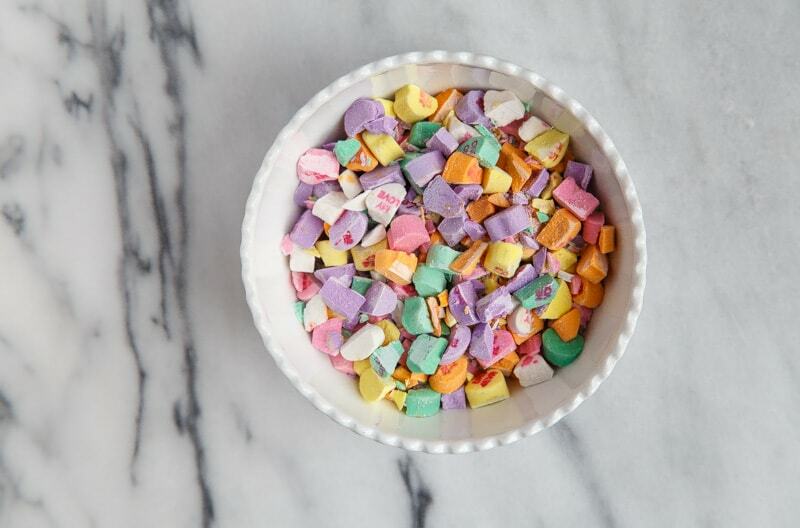 Stir the chopped candy into the sweetened condensed milk in a small bowl. Add the vanilla. Next, beat the cream until stiff peaks form. 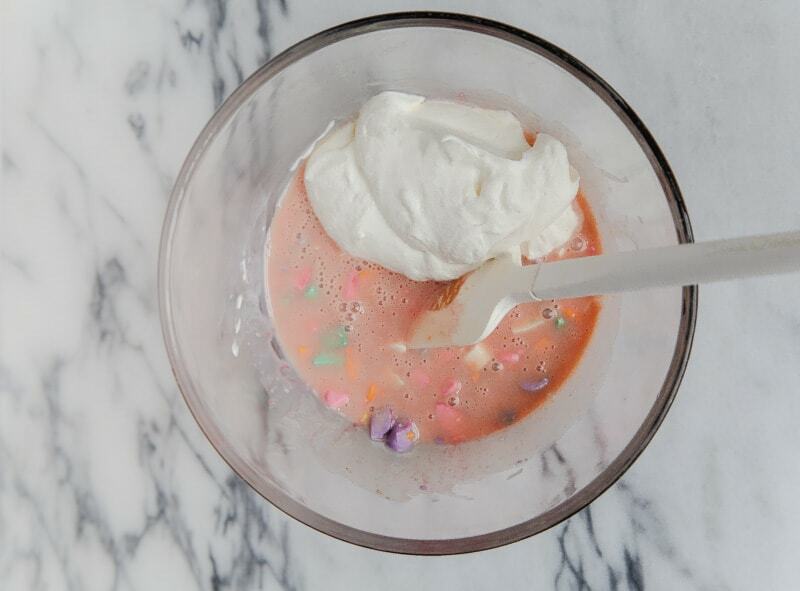 Fold the milk and candy mixture gently into the whipped cream. Scrape the mixture into a loaf pan, cover with wax paper, and freeze for at least 8 hours. Mind blown! 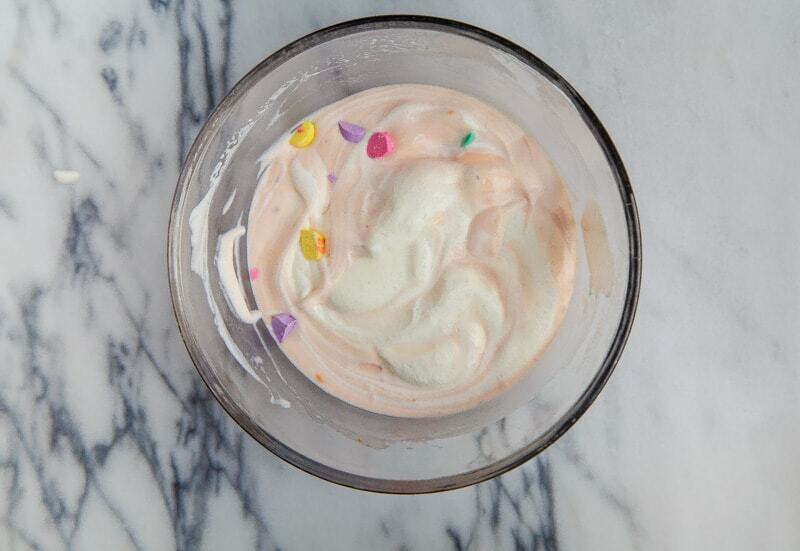 Thank you for this introduction to easy homemade ice cream!!! This is very intriguing. I don’t like conversation hearts that much, but you make them look good. I’m tempted to give it a try. I have a huge bag of hearts left over from last year that I never opened. I am assuming they are still fine. So this is a good way to use them up. I’ve never made no churn ice cream. Looking forward to giving that a try. 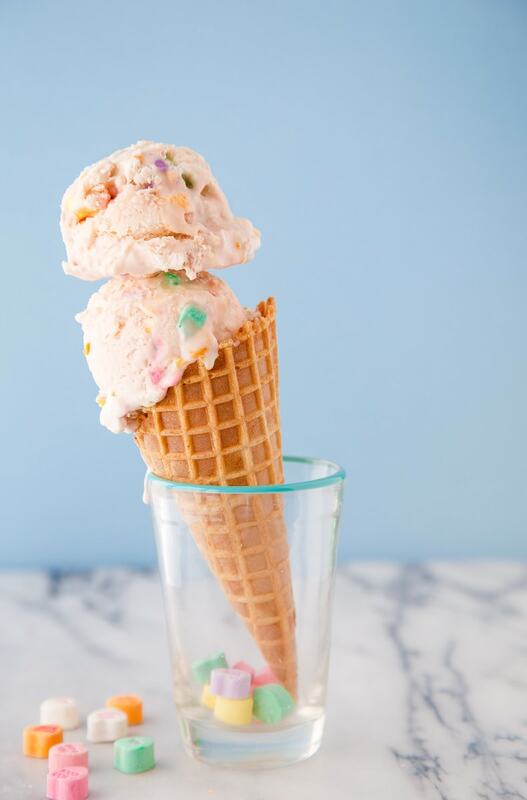 My grands and I have been making this ice cream frequently- they will love it with the hearts! What a fun idea Christina and the recipe couldn’t be easier! I must admit I am thinking “why did I not come up with this? !” Such a great idea! I kind of want to see how cinnamon hearts work in the ice cream as they are my sister’s favourite. This is just too cute! LOVE! You’re killing it with the Vday recipes! I WANT EVERYTHING! 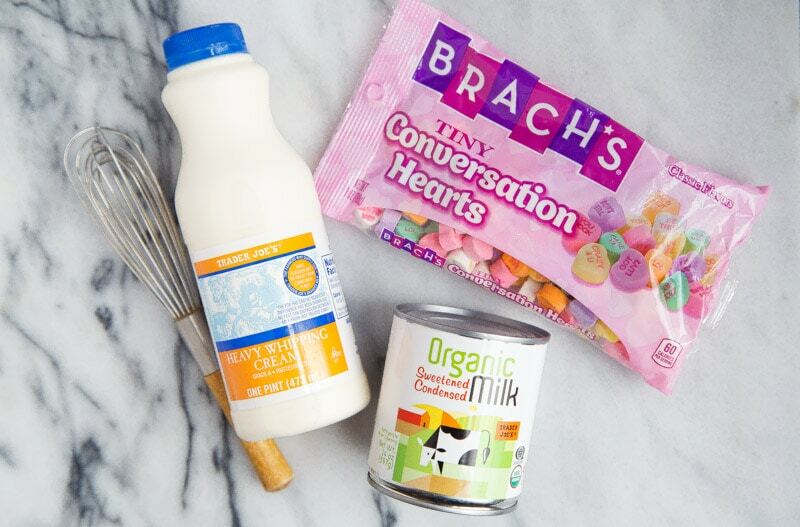 I’ll have to check out the Trader Joe’s condensed milk – one of the few things I haven’t tried from there yet. :) What a fun ice cream for a Valentine’s treat! 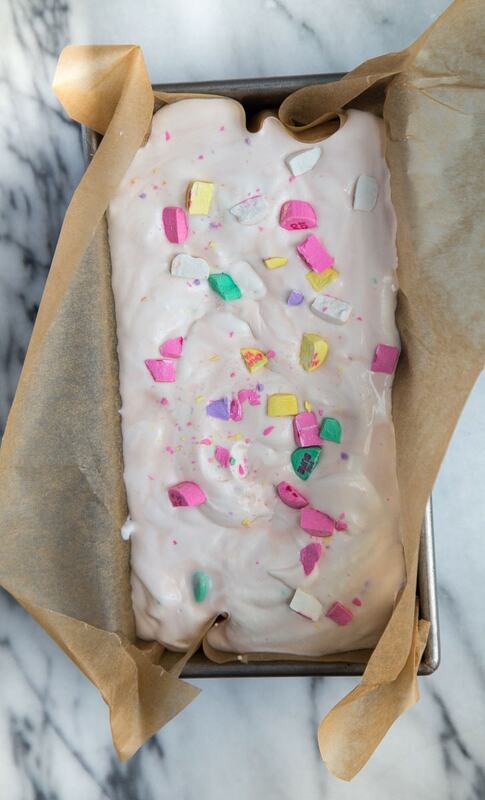 This is such a fun – and yummy – idea! I’ve never made no churn ice cream, but I think it’s time to give it a try! What a FUN ice cream! My girls would love this for V-Day!!! This is so cool!! I’ll have to try this recipe out! YEs!! Brach’s has the best conversation hearts!! I’m so glad you are using htem for this recipe! I’ll have to try it sometime because wow, do I love this time of year for the candy alone.